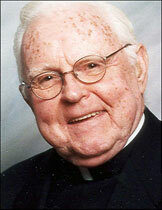 Father Martin is a true celebrity - known both nationally and internationally in the alcoholism/addiction field. With a blackboard as his only prop, Father Martin has been educating for over 50 years. By 1970, with the permission of his superiors, he worked full-time as one of the foremost lecturers and consultants on alcoholism. Although he has spent much of his time on the road, lecturing around the world, Father Martin has found time to preside over Ashley, a non-profit treatment center in Havre De Grace, Maryland. He continues to be known and loved by thousands upon thousands of recovering alcoholics and their families, many of whom he has personally helped through lectures and films.